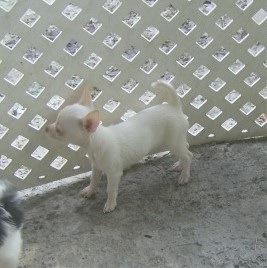 Biography: Bachlee came into my life after the loss of my former Chi right before the 4th of July of this year. I never thought of replacing him as my grief compounded with each passing day. I contacted the lady who I got him from and let her know my darling Victor was gone. A few days went by and she told me that what I needed was a new one. I just did not feel it, but she asked me to trust her on this. She told me she had one she thought would be great for me and that if it did not work for me she'd take him back. She was right! Pictures did not do him justice. When I went to get him on October 12th, he was swaddled in his blanket and I fell in love with him immediately. You always feel nothing can take the place of something that has meant so much too you and this is usually true. But Bachlee did not take a place, but made his own. He is just the opposite of my former spirited and upbeat Victor. But his loving, soft and quite demeanor is so strong and giving. He is my precious new jewel! He is the sweetest.